My favorite thing about this time of year is to open all the windows in the house for the first time since fall and air out the house – it’s a sure sign spring has begun! Unfortunately, this time of year also means it’s spring cleaning time. 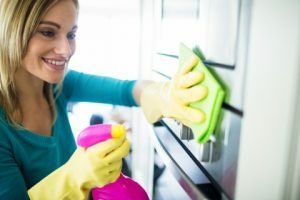 Cleaning your house from top to bottom involves a lot of bending, reaching and twisting that could cause you neck pain or back pain, and we all need to be aware of this fact. If spring cleaning isn’t done correctly, it can cause far-reaching health problems, consisting of neck and back pain. At my Leawood office, we see an influx of new patients that injured themselves during their spring cleaning ritual. There are tons of safety precautions you should think about during spring cleaning, but today I want to give you a simple checklist of spring cleaning tips to protect your back while you make your house sparkle, and donate that unused stuff in your garage. Before starting your cleaning marathon, make sure your blood is flowing and your muscles are warmed up. This is huge when it comes to preventing back spasms & back pain. Don’t just bend straight at your waist and reach with your arms. Bring things closer to your body to give you better control. This will protect your arms and your back. Yes, this means with mopping, sweeping, and vacuuming. All my Overland Park chiropractic patients know this is a big deal to me. Bring the broom handle or vacuum handle closer to you and try walking back and forth instead of twisting your torso. Make sure to bend at your knees and bring the item as close to your body as possible. This is especially important when carrying the vacuum up and down the stairs or transferring the bucket of soapy water from the sink to the floor. We all feel like on the first day of spring every inch of our house must perfect – no so! As my mom would say, “Don’t worry the dirt’s not going anywhere.” To avoid back pain spread your larger tasks out over a couple weeks with smaller projects in between. This gives your back muscles time to recover which is huge in preventing back pain. If you feel your body trying to tell you something – LISTEN! Take a break and sit down. If your muscles feel tight, some light stretching without twisting your spine is usually okay (make sure you clear this with your chiropractor first) and then sit with an ice pack. Hopefully, you breeze through your spring break cleaning like a pro, but if you end up causing yourself back pain call Adjust Your Health in Leawood or Overland Park. We can help you get back to full, pain-free functionality quickly, making you able to enjoy the abundant gifts of spring in Kansas. Happy cleaning & thanks for reading!